Microsoft will continue to bring social tools to the Xbox, with the company suggesting that the interactivity of the newly launched Sky Player is just the tip of the iceberg in terms of what innovations lie ahead. 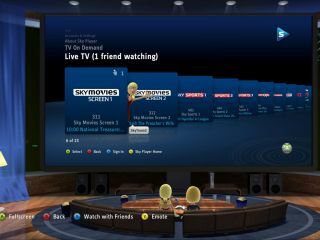 Speaking to TechRadar at the launch of Sky Player on the Xbox, Microsoft's Neil Thompson confirmed that the forthcoming arrival of Twitter and Facebook on the Xbox 360 were also just a step along the path to a truly social entertainment experience. "Everyone wants to tweet, everyone wants to Facebook and I can tell you that we will expand the types of services we offer over time because we think this is just the core element for what the future of entertainment is," said Neil Thompson. "That's what we are trying to define and deliver all at the same time. The social capabilities that we bring are going to be at the heart of what we do in the future. "Whatever technology that is, it is going to be a core part of the future. We never stop developing." Thompson said that, although the Sky Player would launch without support for some of the forthcoming technology, integration in the long term was likely. "We don't have current plan today to do in short term but all of this stuff is going to be in the domain." One of the technologies that is very much on the horizon, but stirring up huge excitement, is Project Natal – the motion sensor tech that was shown off to such great effect at E3. However, an Xbox spokesperson was not going to go into the potential for linking Natal into the social aspects of either Sky Plyer or anything else within Xbox Live. "The possibilities are endless but at this point we're not talking about it," the spokesperson said.